I have just started to use my brand new Garmin Zumo 450 on my GTS. My early assessment is that the Zumo works as advertised. It was really simple to set up, all I did was turn it on and tell it where I was in the world and the time zone. A few moments later, voila, it knew I was in my front yard. Neat. So the first thing I did after getting the mount on was to just go for a ride, no route inputted. I found that it was easy to read, even in the sun. I could easily use the speedometer on it which I now realize means that my speedometer is about 10% optimistic, more than the 8% I had guessed it was. 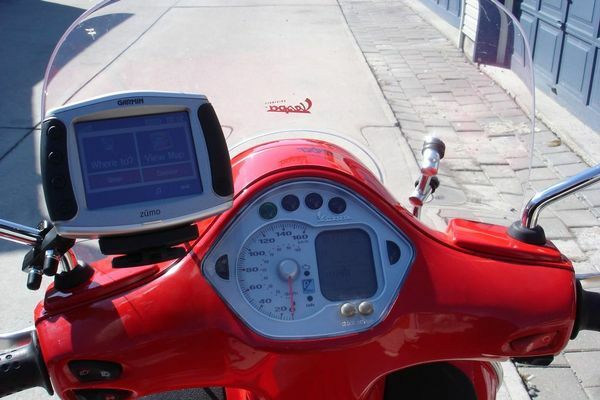 It is very easy to use, I can zoom in or out with a simple press of the touch screen allowing me to see the individual streets as they come up or a farther back view of the city and anything in between. At the top of the screen the next street name is always in view which is nice because signs are often hard to read. Next thing I did was to try out the software. Actually, since I have a Mac and I haven't even tried to figure out the software that came with the Zumo, I used a ride route that Shane created on Google Maps. With some help from Tim, I was easily able to create a file that I then put into the Zumo and voila, a ride route is created. So I jump on my scooter and go into the route folder and press the appropriate route (not hard since there are only two in there right then) and told it to start. The Zumo then asks if you want directions to the starting point of the inputted route. Yes, sure, why not. Nice and easy it starts to give me directions on the screen with large arrows showing which street to turn which way. As well, at the top of the screen, it shows the next turn coming up and on the bottom right, it shows how far until that turn. Nice feature especially when you're in uncharted territory and have no idea where you are. A few times I decided that I'd make a deliberate mistake and not follow the instructions given to me by the Zumo. It fairly quickly reroutes and gives you new instructions to keep you on your path to the correct destination, neat. At first it will try to get you back on the correct road if possible. If you go too far off the path, it will recalculate the next best route which might not include the road you were last on. So, thus far I have only used it a little bit, but so far, I think it works well. The touch screen and the unit is designed to be used with your left hand and designed with large buttons to allow use with gloves on, unlike some car based units. If I had my headset on, I could have connected it to the Zumo to allow auditory instructions as well, but I have not yet purchased the necessary adapters to utilize that function. Overall I am happy with my purchase. Thanks for the review, Benny. How about some pictures? Also, what'd you pay (and where) and how'd you mount it? Stolen from my other thread. 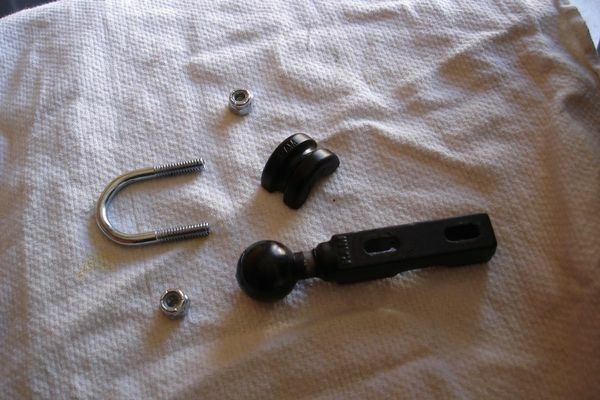 That is essentially the mounting kit that comes with the Zumo out of the box. 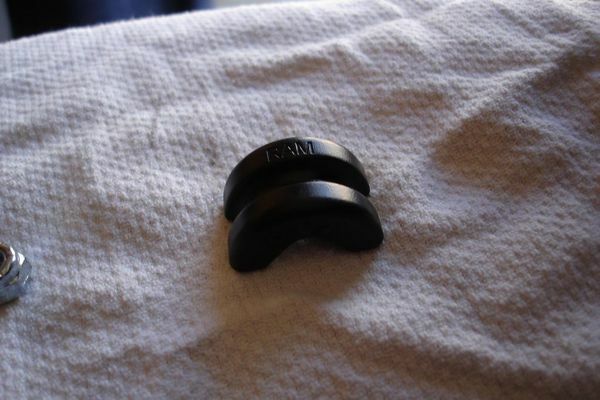 The only extra piece I bought was this $2 U shaped piece that allows me to use the handle bar mount on my mirror stem. This is a photo of the Powerlet outlet with the Zumo's power outlet from Powerlet plugged into it. 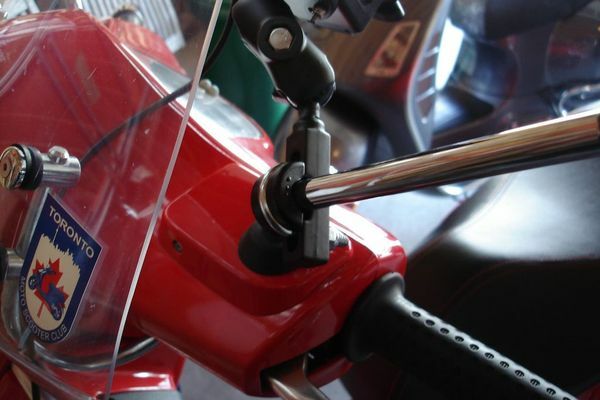 Here is the handle bar mount with the U shaped filler piece mounted on the mirror stem. 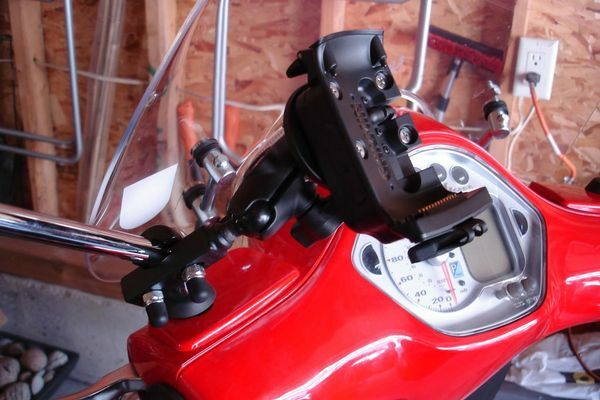 This is the arm and cradle now mounted on the mirror stem assembly. Finally this is how it looks from the rider's prospective. Thanks! That looks pretty good. Being up in Canada, I paid in CAD from a place up here, it costs between $700 to $800 which is very pricey in my mind. 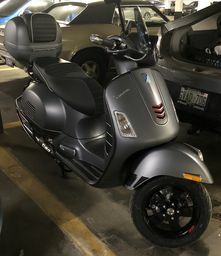 I'm new here too and was considering the Zumo for my new scooter this summer. Can you also fill in some blanks for me with regards to the power outlet? Thank you. I'm new here too and was considering the Zumo for my new scooter this summer. Can you also fill in some blanks for me with regards to the power outlet? Thank you." This is a very old thread and as such you may not get a response from Benito. If you would take a couple of moments I'm pretty sure you will find all the information you need plus more by using the "Search" button. Try looking for "Powerlet" as an example, I just now did it and there are a lot of threads with information on installing, wiring, sources to purchase kits, etc. Scooter West apparently carries the kit and it looks good in the photos, plus there are a number of forum members who have used it for the application you're seeking. If you don't want to buy a Powerlet kit it's easy to drill a small hole in the "knee pad" plate and fish a wire for your needs through it. 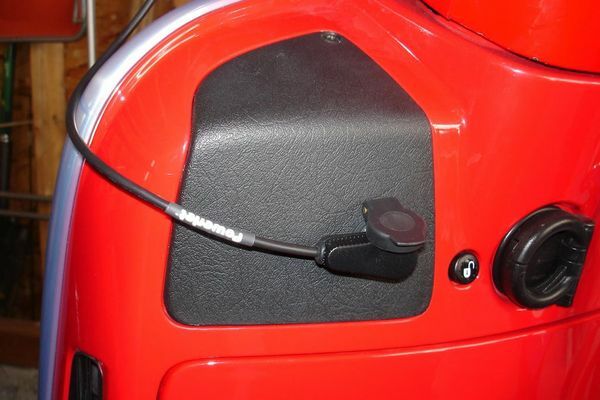 Inside the LH knee pad compartment you'll find a power plug and you can tap into the wires leading to it. When you make the connection you'll find both switched and unswitched power; for your GPS you'll probably want to use the switched lead so you don't leave it turned on and find yourself with a dead battery the next day. BTW I added a small rubber compression ring to the hole to keep out moisture. They're cheap and available at automotive stores, Radio Shack, etc., and worth installing. Enjoy, and don't overlook the forum's Search feature, it works great.